The Candela AlexTriVantage laser machine uses the power of three different wavelengths to provide exceptional results for tattoo removal and vascular pigmented lesion removal. This system offers wavelengths of 532, 755 and 1064 nm that allows it to treat virtually any color of tattoo or pigment. To remove many of today’s complex and colorful tattoos, you might need two or even three separate cosmetic laser systems. But if you buy a used Candela AlexTriVantage laser machine from SunrayLaser.com, you can remove almost any tattoo with just a single system. 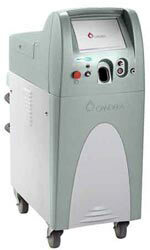 Contact us today for the lowest price on a pre-owned Candela AlexTriVantage laser system. With a Q-switched Alexandrite laser and the ability for a 100 microsecond long pulse mode, the Candela AlexTriVantage is powerful yet gentle. No other machine on the market today is as fast or effective for tattoo removal, and no other company can deliver a pre-owned Candela AlexTriVantage laser machine at a lower price than SunrayLaser.com. If you buy a used Candela AlexTriVantage laser system from SunrayLaser.com, you not only get a quality refurbished system that meets or exceeds the manufacturer’s specifications, but you also get our full satisfaction guarantee. To get more information on this model or to get the lowest price quote on Candela AlexTriVantage laser equipment, simply fill out the no obligation form below.